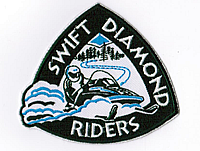 The Swift Diamond Riders maintain over 100 miles of scenic trails through vast woodlands, weaving along rapid streams and over scenic mountains. There is plenty of wildlife to see too. 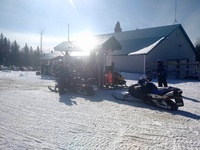 The Warming Hut/Clubhouse is located at 978 Diamond Pond Road. They have 24/7 gas, 91 octane, which operates on credit card. They accept MasterCard and Visa. There is also plenty of parking so you can ride right from the clubhouse. The Warming Hut is open from January 1st till March 30th. They serve breakfast and lunch on Saturday and Sunday from 8-4. There is a variety of food on the menu. They also sell memberships, clothing, maps and oils for your machine. Stop in and say “Hi” to the girls in the kitchen this winter! Word on the trail is, the apple crisp with whipped cream is the best!